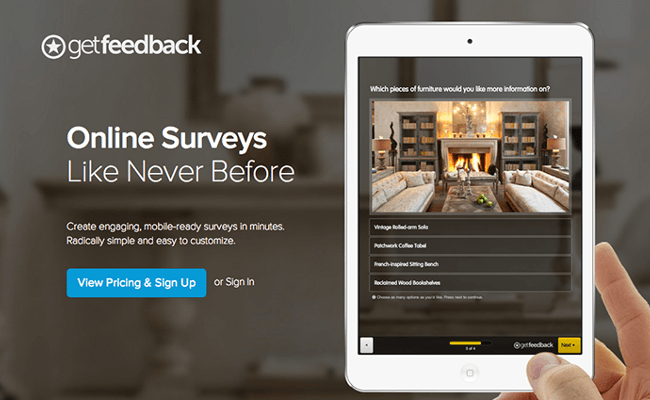 Feedbackify is an easy-to-setup online feedback tool for your website. With Feedbackify, you can create feedback forms with a drag-and-drop editor. Website visitors can leave ratings and comments, including compliments and suggestions. A real-time dashboard can be used to see and analyse all feedback. Unfortunately, however, this tool doesn’t offer advanced reporting or text analysis capabilities, but if you’re going for cost-efficient and simplistic, well then this is a great tool for you. So what are the alternatives? Let’s take a look below at the top 10 alternatives and competitors. 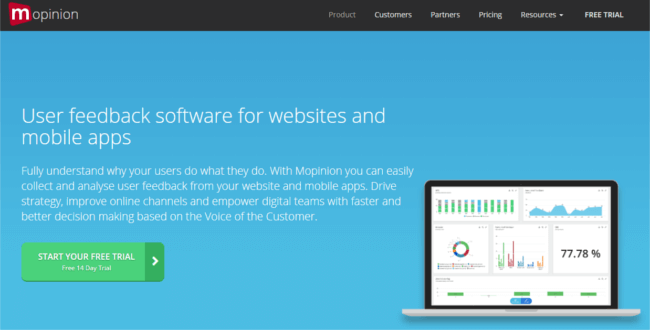 Mopinion is a feedback analytics software that collects and analyses both website and mobile customer feedback in real-time. Users can build, design and configure feedback forms however they like. They can also target specific groups of online visitors with feedback forms and gain insights into why they are struggling to convert. This is done using advanced triggers that deploy forms (either in modal, slide-in or embedded on the page) based on digital visitor behaviour. Upon collection, feedback items can be visualised in customisable dashboards and charts for advanced analyses. 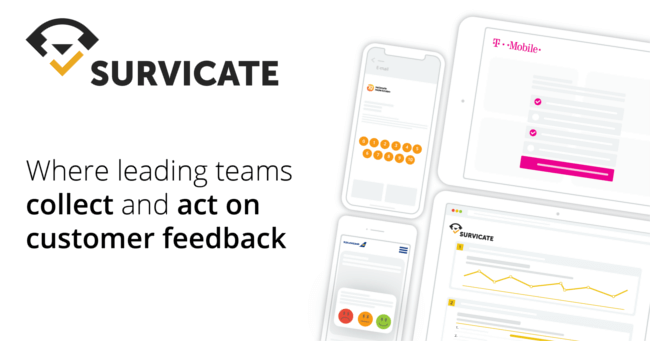 Additionally, digital teams can share and take action on these feedback items in a timely manner using Mopinion’s smart alert feature. Another interesting alternative is Qualtrics. Qualtrics is an online survey software that offers readily made survey templates as well as features including display logic, email triggers and logic branching. Included in its real-time web reports, users can choose from over 30 different graph types and export feedback results to CSV or SPSS. It is important to mention however that Qualtrics is a bit limited in its customisation options (e.g. editing end of survey messages). This tool is much better suited for those seeking traditional research solutions – such as standard questionnaires – as Qualtrics does not specialise in digital channels. Zonka Feedback is a customer experience and feedback management platform intended for a variety of industries, including hospitality, healthcare, retail, and more. In this customer focused environment, Zonka helps companies get close to their customers by collecting their honest opinions through various channels including on- and offline, email, SMS, QR code and in-app. Zonka offers a great drag-and-drop feature for creating/designing surveys as well as live alerts and real-time reports. While it has a nice dashboard for analysing data, exporting the data, however, can be a bit of challenge. MyFeelBack is a robust SaaS platform that helps companies capture the customer insights they need to make data-driven decisions and improve their business. Users can quickly build smart surveys using the editor. It is also handy to know that this platform offers integration with several CRM applications, allowing you to personalise surveys for your individual visitors. MyFeelBack also allows users to perform analyses with the incoming feedback data via live dashboards and real-time reports. GetSatisfaction is primarily an online platform that powers more than 60,000 communities worldwide, helping companies build better relationships with their customers. However it also offers a customer feedback solution catered to users looking to provide their visitors with a more social experience. Users can collect feedback (including compliments, problems, questions or suggestions) from every page of their website, which ultimately ends up in a public forum.There are, of course, also several options for forum moderation and management. Because GetSatisfaction is so focused on community feedback, it’s not exactly the ideal tool for deep insights into the customer journey or customer experience. Qualaroo’s mission is to help companies understand why their customers and prospects make decisions by building, managing and analysing actionable insight programmes. This software is quite simple to set up and manage, thank its survey building / design tool, wide range of customisation options and easy-to-manage dashboard. A couple other interesting features this tool provides include targeting particular audiences and intelligent question branching. Having that said, it’s important to point out that feedback data collection is where Qualaroo excels. Analysis (e.g reporting functionalities) on the other hand is rather limited. 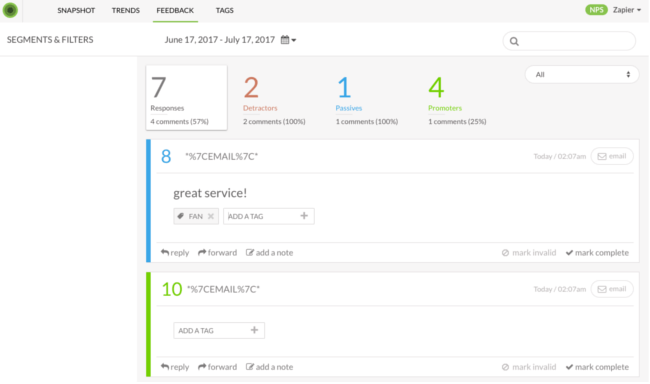 GetFeedback enables users to build branded surveys with help of a drag-and-drop tool and several different personalisation features. This survey tool is fairly flexible in that it adapts to almost all platforms used to distribute surveys. Are you an avid SalesForce user? Well then you’re in luck. Survey results from GetFeedback are visible in your SalesForce dashboard once integrated! But here’s the silver lining: question types, data presentation and overall customisation options are all limited with GetFeedback. Not to mention, it focuses heavily on email surveys and catering to customer service goals, aka. it’s not an ideal digital solution. Wootric is an online survey tool that makes use of single-question microsurveys. Most of these surveys include metrics such as Net Promoter Score (NPS), Customer Satisfaction (CSAT) and Customer Effort Score (CES). What’s especially great about this tool is that it can be installed quickly and easily. All feedback (once collected) is sent to your live dashboard for review. Unfortunately, however, Wootric does not provide templates, question branching or data analysis tools. 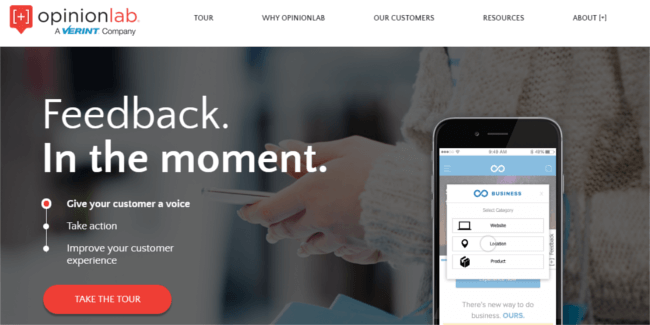 Opinionlab is a popular Voice of Customer platform that collects feedback via standard surveys. While this tool was initially focused on website feedback it’s now positioned a lot broader. In other words, it can also be used to gather feedback from offline channels – making it more of a traditional VoC tool. Opinionlab is, however, a bit limited in terms of customisation. And when it comes to reporting, there’s not much flexibility in reports and dashboards. Want some advice? Focus on the various techniques these tools provide for collecting, reporting or analysing online user feedback from your websites or mobile apps and sign up for a demo! Good luck!